Following Apple's announcement of plans to repatriate a chunk of its overseas cash to infuse some $350 billion into the U.S. economy over the next five years, CEO Tim Cook took part in an interview addressing the company's investment strategy, the iPhone slowdown controversy and more. 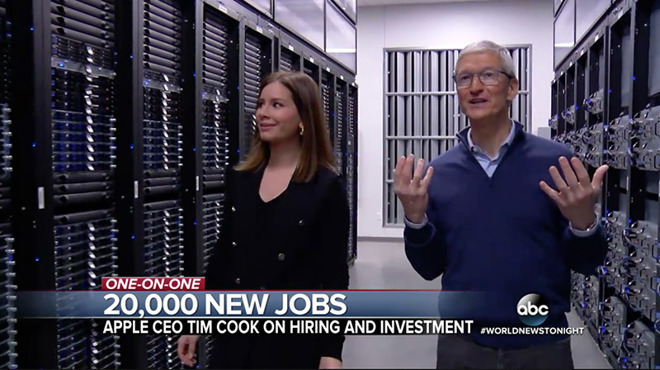 Speaking with ABC News' "World News Tonight with David Muir," Cook discussed the intricacies of Apple's forthcoming investment, which will incur a foreign tax bill of $38 billion. Earlier on Wednesday, Apple foreshadowed a major shift in financial policy when it announced plans to repatriate a portion of its overseas cash hoard, a move that will pump $350 billion into the U.S. economy. That money will in part go toward a new campus and the generation of 20,000 jobs. The company expects to pay $38 billion in taxes on the repatriated funds, a sum it says is the largest ever of its kind. In a one-on-one with reporter Rebecca Jarvis, Cook explained that recent U.S. tax policy changes allowed for the huge capital commitment. Still, the executive insists that some changes, perhaps the grant of employee stock bonuses, would have been made "in any situation." Jarvis suggested President Trump's tax bill is a "huge windfall" for Apple, a statement Cook did not directly refute. Just prior to the ABC News exclusive, Trump tweeted out a message taking credit for Apple's announced investments. "I promised that my policies would allow companies like Apple to bring massive amounts of money back to the United States. Great to see Apple follow through as a result of TAX CUTS. Huge win for American workers and the USA!" Trump wrote. The conversation moved on to Apple's handling of iPhone battery issues. In 2016, Apple released an iOS update to deal with unexpected iPhone 6, 6s and SE shutdowns related to depleted battery cells. Release notes issued at the time did not specify how, exactly, the software fix handled the apparent problem, but users late last year discovered evidence that it throttled processor speeds. Amid pressure from customers and media outlets, Apple in December confirmed iOS temporarily slows down processor-intensive tasks on iPhones with degraded batteries in an effort to keep those devices operating smoothly. The revelation has since spawned numerous class-action lawsuits and government inquiries into so-called planned obsolescence. "When we did put it out, we did say what it was, but I don't think a lot of people were paying attention and maybe we should have been clearer, as well" Cook said. "And so we deeply apologize for anybody that thinks we had some other kind of motivation." Finally, Jarvis asked whether Apple's decision to bring money back into the U.S. will result in a cheaper iPhone. Cook dismissed the idea, saying the "the phone costs what the innovation inside of it costs." She also confirmed with Cook that Apple's new campus will not be located in California or Texas, where the company already operates large facilities.